Is The Toyota FT-4X A Future Jeep Wrangler And Ford Bronco Rival? This month Toyota registered a trademark for “FT-4X” as a name for a car or truck. In Toyota language, “FT” (Future Toyota) identifies it as a concept vehicle. As for “4X,” what else but four-wheel drive? Perhaps, if we follow this trail of crumbs, the company is reconsidering its position on an FJ Cruiser-style recreational truck. Toyota’s FT-4X trademark as filed with the USPTO. 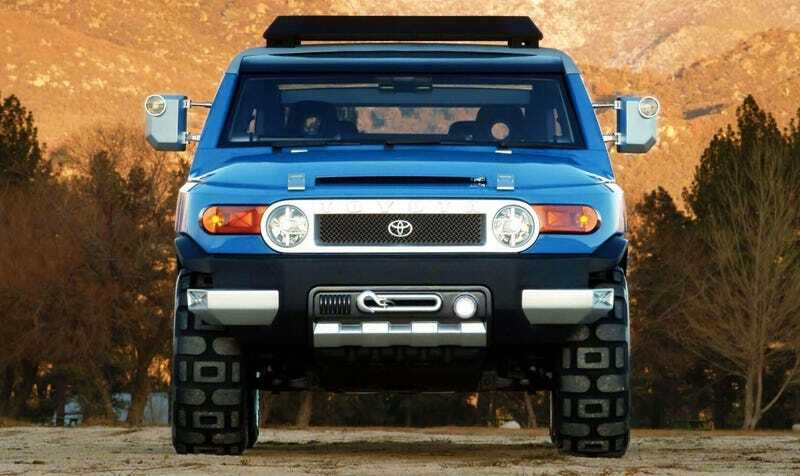 For a while there the FJ Cruiser was the closest contemporary thing any automaker had to a Jeep Wrangler rival—built for off-roading, aggressive looking, the kind of truck you tried to convince yourself was practical. Production was quietly wrapped up with the end of the 2014 model year and we were all advised to buy 4Runners instead. But this news of the “FT-4X” trademark comes at an interesting time. Jeep Wrangler hype is at an all-time high thanks to anticipation surrounding the vehicle’s 2018 redesign, “new Ford Bronco” rumors are roaring since that company’s union chairman decided to tell the press the nameplate was being revived, and all the while the values of actual vintage SUVs have been steadily heading up for years now. Moreover, Toyota’s FT concepts often preview future road cars. The FTX pickup gave us a decent look at the second-generation Tundra. The FT-SX was a harbinger for the Venza. The current Sienna minivan got some style from the FT-MV. The current Prius got its cues from the FT-Bh and the new Supra, if that’s what it’s called, seems to take influence from the FT-1 and FT-HS before it. I don’t think it’s a huge leap to take these circumstances, along with the logic that “4X” does sound like it implies four-wheel drive, and say it sounds like Toyota is cooking up a new off-road oriented concept vehicle. I just wish we knew more. Just How Much Water Can An FJ Cruiser Really Handle?